April’s patient of the month is ‘Huey’ Lowe. Huey is a handsome senior Labrador mix. His owners Simon and Sean adopted him in 2012 after seeing him on SPCA’s pet on the net and decided to give this senior an amazing life. Huey unfortunately was living in a neglectful living situation prior to being in SPCA care and had a lot of issues needing care. When Simon and Sean first adopted him he had terrible dental issues, a large tumor growing on his side, giardia and arthritis. Soon after adoption he had a thorough dental, surgery to remove the tumor and was given special medication for his giardia. Huey’s owners help alleviate his arthritis symptoms by feeding him a high quality well balanced diet and giving him omega fatty acids and glucosamine supplements daily. 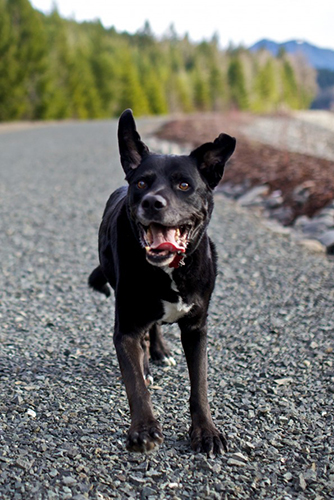 Huey enjoys a very happy, active and social life including doggy daycare, playing ball and receiving lots of love. We love seeing him when he comes in for his exams.